This Sunday night, we decided to change things up a bit. 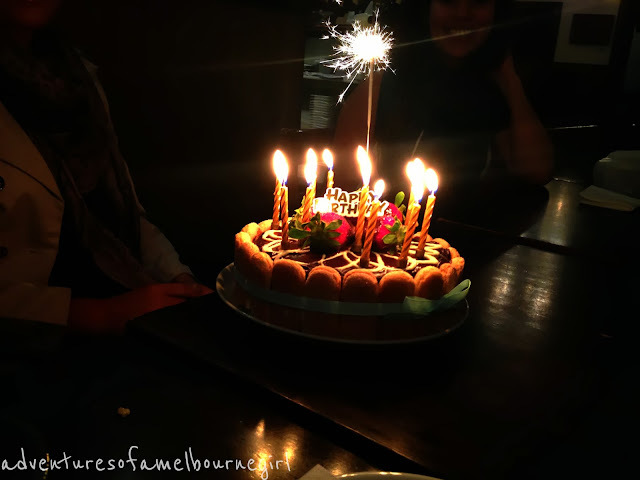 To cap off our fun-filled, family like road trip excursion for the day, we headed off to L'Olivo in Malvern East for some traditional, family-style restaurant dining. Being here took me back to my childhood. As I read the menu, I recalled the days when my family would take us out to a traditional Italian restaurant, and without a second thought I would order the lasgna, or the spag bol - depending on how I was feeling that day. Thankfully, I've experimented a little since then and refined my palate. However, with such a large group of close friends, it felt like I was here with my family, and it was hard to look past the potato chips as a starter to the night. 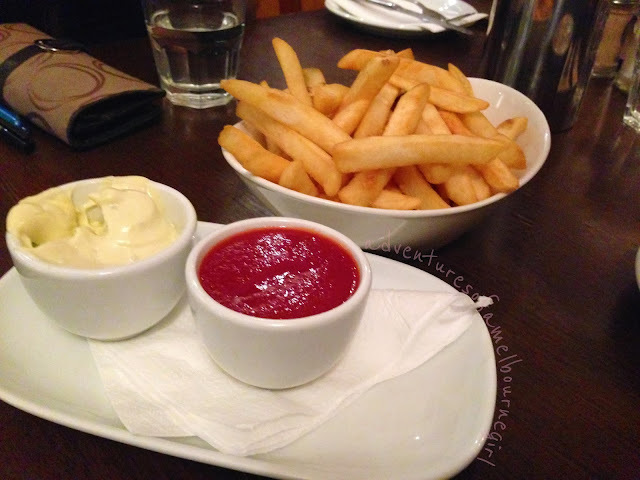 Our bowl of chunky chips arrived shortly after we ordered them, along with two generous bowlfuls of tomato sauce and garlic aoili to dip them into. Crispy, salty, and coated with thick sauce - just the way I used to have it as a child! The first dish of the night to come out was this steaming, hot dish of gnocchi. 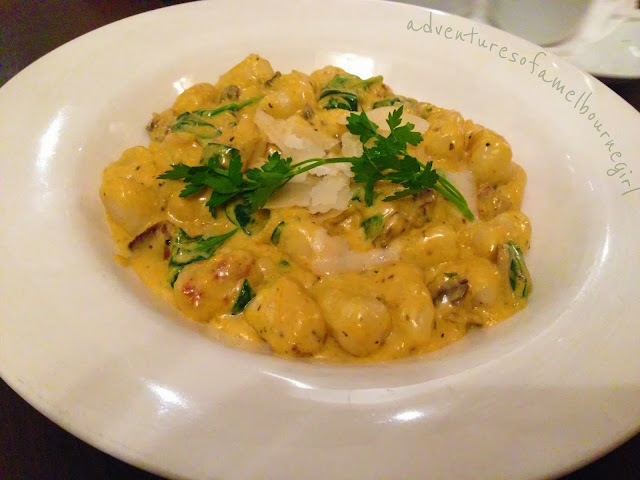 In true Italian style, the gnocchi was melt-in-your-mouth tender, and paired beautifully with the rich and creamy pumpkin sauce, and I simply could not get enough of it! This one was highly recommended, and after experiencing it for myself, I know exactly why. It puts to rest all of your carb, seafood, protein and dairy cravings at once! 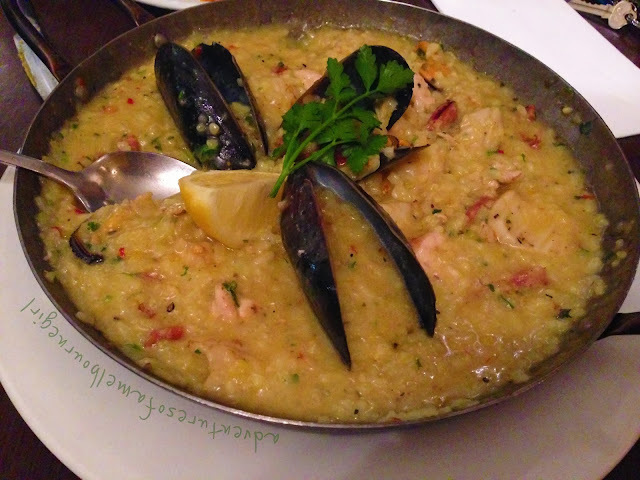 A Spanish concoction of chicken, calamari, prawns, mussells and spicy chorizo in the form of a cheesy flavoursome risotto? This dish was hitting all the right spots tonight. 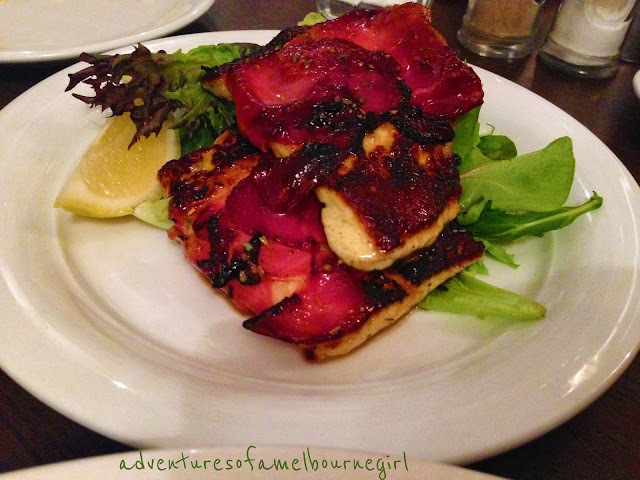 Next to come were these gorgeous little grilled haloumi bundles wrapped in prosciutto. I'd only ever had raw prosciutto before, so suffice it to say I was expecting some saltiness. However, I feel like it could have been complemented with something a little sweeter to off-set to saltiness of the cheese. And finally, the last dish to arrive was my salad! At this point, I didn't even think I'd have room for the greens, but I couldn't pass up at least giving this dish a try! It was nice to have something lighter with a bit of tangy and chilliness after such rich and creamy dishes to begin the night with. 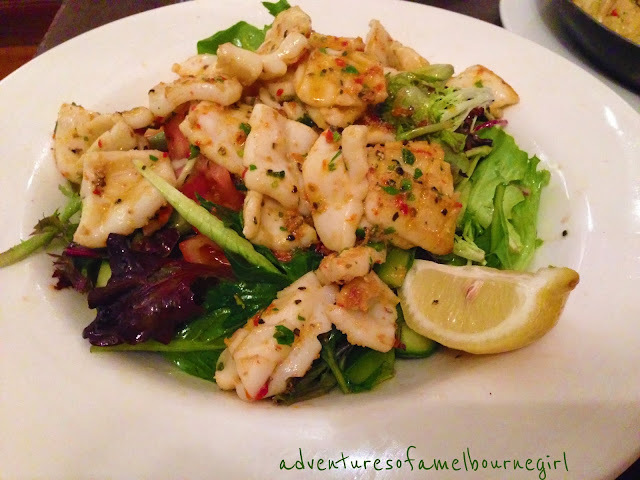 I usually avoid ordering seafood dishes at restaurants for fear of being served a plate of over-cooked calamari rings of tough rubber-like consistency; but this was not the case tonight, L'Olivo know what they're talking about! To finish off the night, we had one of J's authentic, specialty cakes - a deliciously light chocolate sponge layered with strawberries and cream and coated in a gooey Chocolate fudge. Absolute heaven! I was more than impressed by the reasonable prices following such generous servings. The service was friendly and the family-oriented atmosphere made dining here a wonderful experience. Will definitely be back again!